Run by EMT (the Municipal Transport Company), Madrid’s efficient bus service is composed of 2000 vehicles and over 200 bus lines. Most of the city’s main thoroughfares have a bus and taxi lane to ensure the free flow of transport through the busier parts of the capital. Monday through Friday, buses run from 6am till 11.30pm. They generally pass every 4 to 15 minutes, although frequency depends on the line and the time of day. On weekends and public holidays, they run from 7am till 11pm and tend to be slightly less frequent. After 11.30 the city operates night buses (known as búhos, the Spanish word for owls). They run till the early hours of the morning and the fare is the same as for daytime buses. There are 27 lines (N1 to N27), and they all start or end in Plaza de Cibeles. They run every 35 minutes from Sunday to Friday and on public holidays, and every 15-20 minutes on Saturdays and on the eve of a public holiday. You can check the frequency for each line at the corresponding bus stop. To travel to and from Adolfo Suárez Madrid-Barajas you can take the Aiport Express shuttle which goes to the centre of the city, or take one of the two EMT lines that go to the airport: Line 200 runs between Avenida de América and T1, T2 and T4 and Line 101 goes from Canillejas to T1 and T2. Both lines only run during the day and the fare is the same as for other ordinary EMT buses. Buses only stop at designated bus stops, and only upon request. If you wish to alight the bus at the next stop, you must press the button before you reach it. If you are waiting at the stop, as the bus approaches you must signal to the driver that you wish to board. 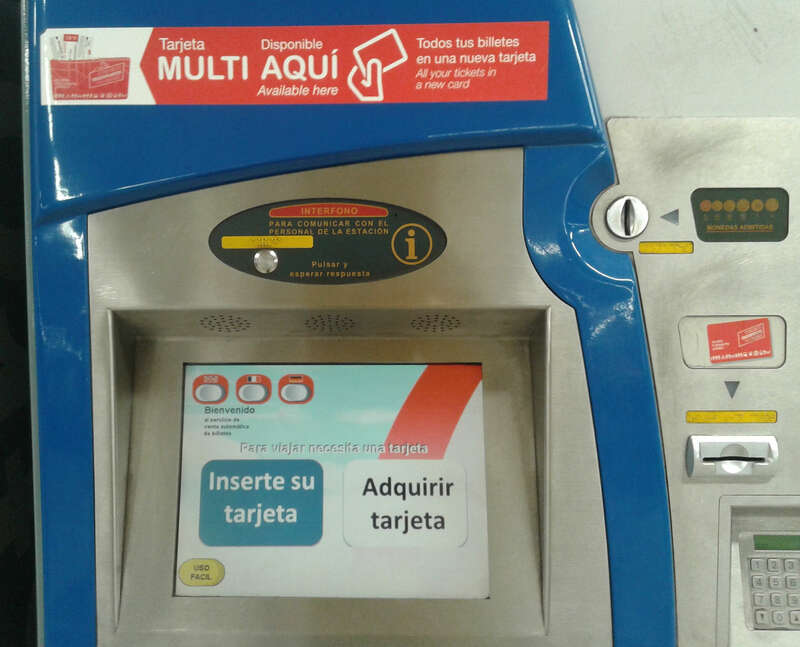 Single bus tickets cannot be loaded on to the Tarjeta Multi smartcard, they must be purchased on the bus. (*) Valid for 10 trips on any EMT bus, Metro Zone A and ML1 tram. (**) Valid for 10 trips that allow you to change buses once within one hour of first touching in (on sale at Estancos). All buses are fitted with a retractable ramp and have space for at least one person in a wheelchair. Wheelchair users must enter the bus using the middle door (not the front door), which is where the ramp is installed. Prams and pushchairs are also allowed on all buses, space permitting. The buggy must have the break on and must be placed so that the child is rear facing. Many buses have a pre-installed car seat that enables young children to travel safely. Foldable bikes are allowed on the bus, space permitting. If a wheelchair user or a person with a pram wishes to get on the bus and there is a shortage of space, the cyclist will need to alight. Guide dogs and assistance dogs are allowed on all buses but must carry their identification tag. The express bus runs 24 hours a day, 365 days a year. It passes through terminals 1, 2 and 4, and makes three stops in the city: next to O’Donnell metro station, Plaza de Cibeles and next to Atocha train station (only during the day). It runs every 15 minutes from 6am to 11.30pm and every 35 minutes from 11.30pm to 6am. Single tickets cost 5 euros and must be purchased on the bus. EMT buses do not accept notes that are larger than 5€. EMT's website offers an online journey planner that helps you find the fastest route to your destination. Tickets for the Airport Express shuttle cannot be loaded on to the Tarjeta Multi, they must be purchased on the bus. If you are planning on using public transport a lot during your stay, consider purchasing the Tourist Travel Pass which entitles you to unlimited travel over your selected time period. Folding bikes are allowed on buses, space permitting. Should a wheelchair user or a person with a pushchair wish to get on the bus, the passenger with the bike will have to get off if there is not enough designated space for both.